13.8 billion years ago, the Big Bang set off a sudden phase of inflation that stretched the primordial Universe at least 1026 times in less than a blink of an eye. The newly born Universe was made of particles of ultra-dense and opaque dark and ordinary matter, as the light generated from the explosion was immediately trapped. While it is remarkably homogeneous, it nevertheless exhibits small fluctuations in pressure and temperature resulting from the tiniest variations present at the instant of inflation. The Universe subsequently continued to expand at a slower rate, becoming more diluted and cooler. 380,000 years after the Big Bang, it had cooled sufficiently for electrons and protons to combine and form the first atoms. It therefore suddenly became transparent, freeing the light that had previously remained trapped: thus, the cosmic microwave background (CMB) - the afterglow or relic radiation from the Big Bang - was born. 13.8 billion years later, the initial variations have gradually condensed under the effect of gravitation, and increasingly complex structures like galaxies and galaxy clusters have appeared. From one of these galaxies, our Milky Way, scientists have predicted and then detected the relic radiation reaching us from ever-more-distant regions after a journey of 13.7 billion years across an expanding Universe. As a result of this expansion, its wavelength has been stretched to the millimetre domain. Crédits : ESA – C. Carreau. The history of the Universe: after initial inflation, radiation combines with particles of matter. At this stage, the Universe is opaque and expanding gradually, while matter is accreting around clumps of dark matter. After 380,000 years, radiation is free to propagate and structuring of matter continues to the present day. Credits: ESA – C. Carreau. The COBE and WMAP satellites, as well as the Archeops balloon, have mapped this radiation with continuously improved angular resolution (the ability to pick out tiny features) and sensitivity (the ability to distinguish very small variations in brightness). They confirm a number of predictions made by the theory describing the very early Universe, although with a degree of confidence sometimes limited by instrument performance. two unprecedented maps have been compiled of the gravitational potential and the cosmic infrared background (CIB); the first is obtained by measuring the tiny deviations of photons in the relic radiation that occurs when passing near a gravitational well (i.e., a massive object); the second is the sum of the infrared light of all galaxies, which we see in the form of a heterogeneous fog; these maps show how dark and ordinary matter have interacted through the ages. To obtain these results, the Planck teams have achieved a major feat in signal processing, filtering out the smallest instrument biases in the measured signal and then teasing apart the contribution of the background radiation and that of the foreground galaxies. This produced 9 maps of the relic radiation in the 9 frequency bands of Planck’s instruments (6 for HFI and 3 for LFI). The reconstituted spectrum corresponds to the temperature of the CMB: 2.7° K. Variations in the CMB from one point in the sky to another are no more than a few millionths of a degree! Crédits : ESA and the Planck Collaboration. Working from the raw map, the various contributions are separated. The intermediate maps thus obtained provide precious data for the study of our galaxy, for example. 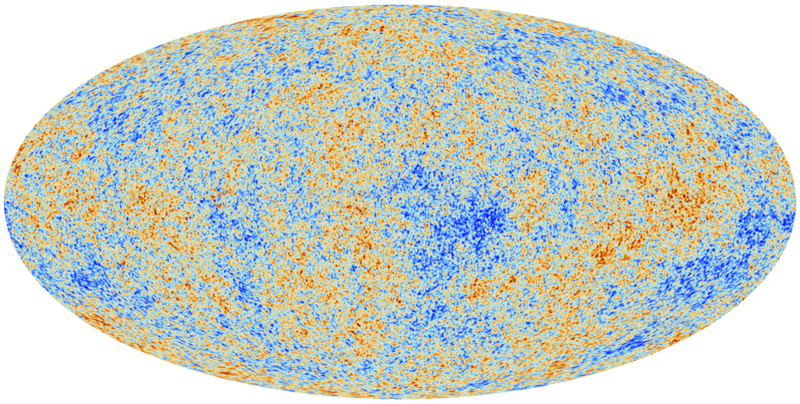 The final map shows the temperature of the cosmic background radiation. The orange patches are the hottest and the blue patches the coolest. Credits: ESA and the Planck Collaboration. And Planck may have more surprises in store for us in 2014 once all of its surveys are analysed. France is the lead nation for Planck’s HFI high-frequency instrument, a vital contributor to cosmological research. Development of the instrument was coordinated by the IAS space astrophysics institute in Orsay, while data processing is being overseen by the IAP astrophysics institute in Paris. CNES supplied about half of French funding for the instrument as well as technical support, notably developing the cryogenic system that cools HFI’s detectors to 0.1° K, a record for a man-made space object. CNES is also providing close support for the data processing effort.